The Hotel Mahadev Palace stands tall in the heart of the city offering matchless hospitality and ideal lodging in the city of Jaisalmer. 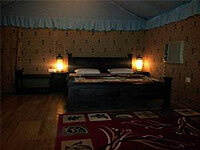 As the name suggests, Hotel Mahadev Palace is designed like a castle in the sandy terrain of Jaisalmer. In keeping with the traditions of Jaisalmer, all exterior is done with stones drawn from most expensive mines of Honey-coloured Jaisalmer stones e.g. Shipra, Moolsagar with grains,. The defining feature of Hotel Mahadev Palace exterior is large stones cut in Rock-face style- perhaps the only building in Jaisalmer to use this style of exterior. Each stone is hand carved with finest artistry by century old skilled stone-carvers. 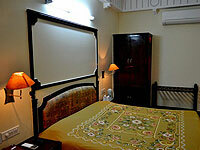 Hotel Mahadev Palace considered as Best Heritage Hotel in Jaisalmer. Hotel Mahadev Palace is a treasure trove of architectural features of Jaisalmer style. The only one -of -its- kind in the world Jharokhas (carved balconies), sit-in chhatris (pavilion with domes) and jaalis (latticed screens). All magnificently hand-carved-they create an ambiance of bygone, opulent era. 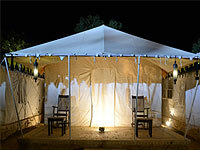 If what you're looking for is a conveniently located hotel in Jaisalmer, look no further than Mahadev Resort. The excitement of the city center is only 45 km away. With its convenient location, the hotel offers easy access to the city's must-see destinations. 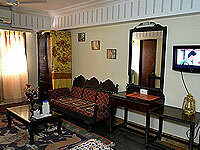 Mahadev Resort offers impeccable service and all the essential amenities to invigorate travelers. The hotel provides restaurant, room service, car park, airport transfer to ensure our guests the greatest comfort. Hotel accommodations have been carefully appointed to the highest degree of comfort and convenience, with desk, shower, air conditioning, balcony/terrace, television in each room. The hotel offers many unique recreational opportunities such as garden. 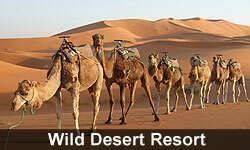 Whatever your purpose of visit, Mahadev Resort is an excellent choice for your stay in Jaisalmer. Business centre with fax, internet connection and Wi-Fi hot zone. On-premise Camp fire and folk-dance arena.